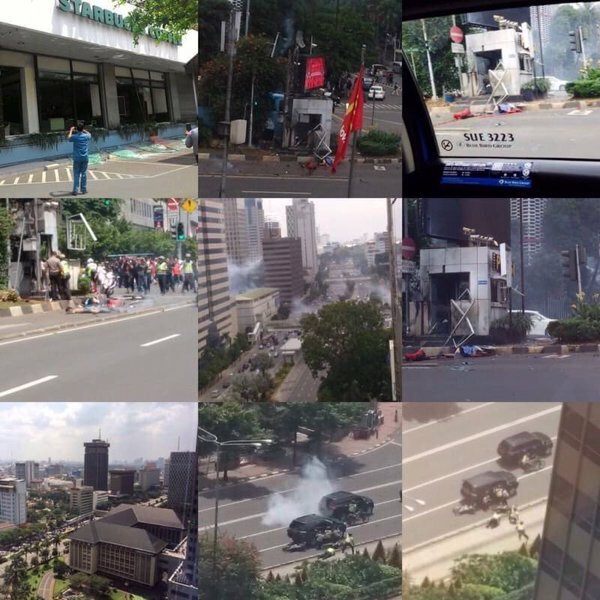 Latest Updates: Jakarta terror attacks (Videos, Photos, News) - Balita Boss! At least 17 people have been killed and unknown number of people were injured in a series of bomb and gun attacks in the Indonesian capital, Jakarta on Thursday morning (January 14), according to Indonesia's police, reported by Al Jazeera. The Wall Street Journal reported that an Islamic State-linked media outlet, Amaq News Agency, claimed responsibility for the attacks. President Joko Widodo has called for calm but condemned the "act of terror". Amateur video, posted by Robert Harianto, shows two explosions in the parking area outside the Starbucks. Jewel Topsfield also posted "The bomb scene" on Twitter.